Dr Andrew Singleton has come a long way from the labs of the University of Sunderland, where he gained his BSc degree over 20 years ago. Now Chief of the Laboratory of Neurogenetics at the National Institute of Aging, in Maryland, USA he is leading one of the world’s top research teams, tackling neurological diseases, particularly Parkinson’s disease and Alzheimer’s disease. Dr Singleton returned to Sunderland this week to receive his former university’s top honour. Dr Singleton received an Honorary Doctorate of Science, in recognition of his pioneering work in the understanding of neurological health disorders. He says: “I’ve been lucky enough to do a job that I love. A job that has allowed me to travel the world, to work with the smartest and most dedicated scientists, and to feel like I’ve made an impact. “We’ve made incredible progress in diseases like Alzheimer’s and Parkinson’s, and I am now more sure than ever that we will find a cure. 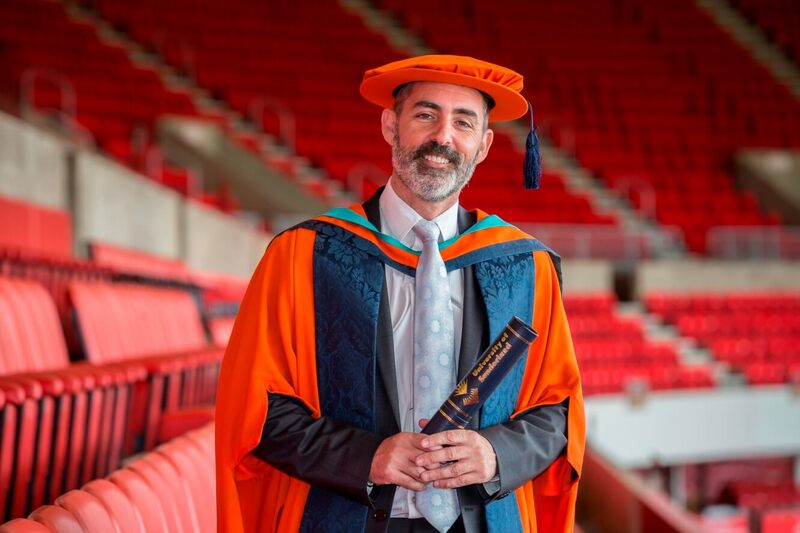 “I am increasingly thankful to the University of Sunderland for helping me start my journey, and for this incredible honour. I love this place. After graduating from BSc Applied Physiology in 1995, Dr Singleton went to study his PhD in Newcastle. He then moved to Florida to work at the Mayo Clinic on the genetics of neurodegenerative diseases. Then in 2001 Dr Singleton moved to Bethesda in Maryland to set up one of the world’s most advanced laboratories. He now leads a team studying the genetic basis of neurological disorders including Parkinson’s disease. He is a Scientific Advisor for The Michael J Fox Foundation for Parkinson’s Research, and on the Scientific Advisory Board of the Lewy Body Dementia Association. Among his many awards and honours Dr Singleton has been presented with the Boehringer Mannheim Research Award, the Annemarie Opprecht Award, the National Institute of Health Directors Award, and was the first recipient of the Jay van Andel Award for Outstanding Achievement in Parkinson’s Disease Research in 2012. It is estimated that almost one million men and women are living with dementia in Britain today. In 2016, the Office of National Statistics reported that Dementia and Alzheimer’s disease had replaced heart disease as the leading cause of death in England and Wales. They accounted for nearly 12 out of every 100 people who died in the previous year.